"I was shaking a bit up there. It's f***ing scary!" 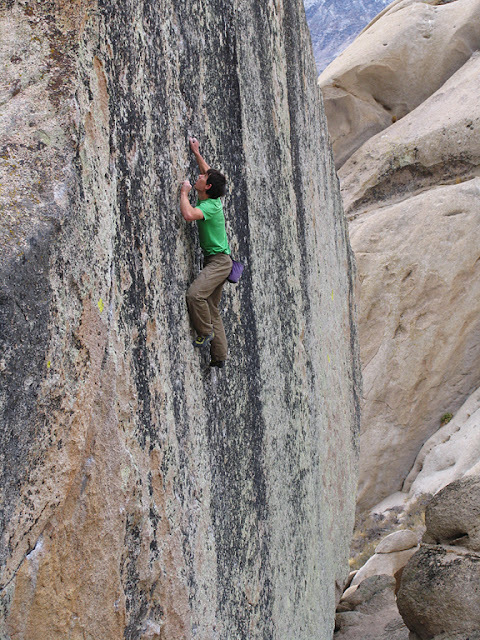 said Alex Honnold after completing his hard new line on the Luminance Block. 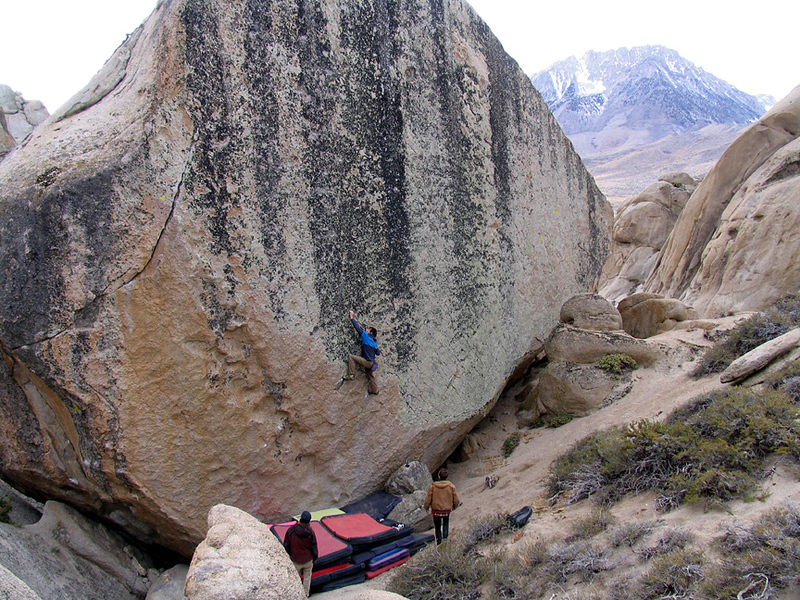 This line takes on the sheer face right of The Golden Rule and involves some thin v9 face climbing at about 20 feet up, followed by the most airy hard moves at the Buttermilks to gain the top of the boulder--which, in this case, was about 50 feet above one of the biggest stacks of crashpads ever compiled. 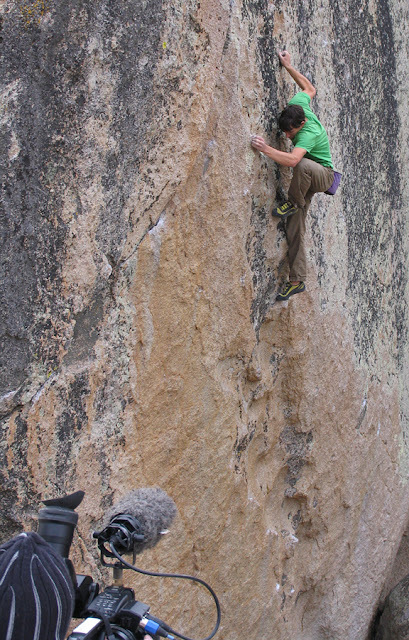 Friends and acquaintances alike lent pads to or hiked pads up for Alex to fill a dangerous pit between boulders at the base of this spectacular glassy wall. As you can see, the line is truly monumental! It is fairly low angle, an off-vertical wall, and has some of the sweetest rock in the area, water-and wind-polished with glassy crimps and some delicate, balancy climbing. 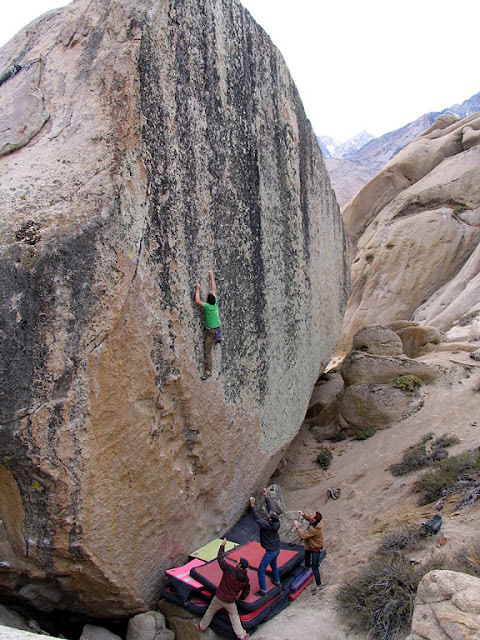 With the moves up high being complex and feet-intensive, this is likely the most serious proposition in the Buttermilks. It was clear that this was a major challenge even for Alex and he was super-psyched with the ascent that was made possible by the use of 34 pads! Good luck on the second! Above: Alex "straightening the rule" with Josh Lowell from the Reel Rock Film tour capturing the action. The guys from The Reel Rock Film Tour, Josh and Pete were both there filming this for a major segment on Alex for their next show. They said they'd have a short clip to post up. See 3rd comment below. I thought he called it rise against. Also of note is that a line here was first top-roped by visiting Brit George Ulllrich during a trip in July! He had hoped to get back to solo the line but his car broke down on Buttermilk Road. See George's blog about this astonishing trip, during which he also established "Call It What You Want" which is the upper part of what is now Ambrosia, climbed from off a ladder--it was too hot to work the thin crimpy start to the line at that time of year! Did you take that photo of Too Big To Flail? I want to give credit on the thread below. Side note: That thing looks knee knocking fantastic! Thanks for the plug. Yeah, these are all my photos in this post. I haven't seen the supertopo. Maybe I'll pass up the oportunity to spray, but I will definitely head over to your own Fish Products site soon! I love that I can choose either to buy you a beer or to save Tibet, and that I have those options before me on the same page. I'll probably just get you a beer. Take care man, and give me a shout when you're up this way. Mr Young have you got a twitter page? Great post. Fun stuff. We decided it was so good that we posted a link to it on The Chalk Pot’s Google+ and Facebook pages. To Phil B: I don't have a twitter page, no. Sorry. Thanks for your comments! Best "blog" post I've seen in a while... great work! 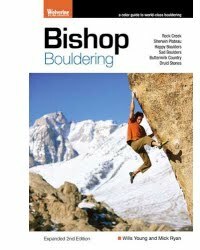 "I got the Bishop Bouldering guide in the mail today. All I can say is WOW. Arguably the best looking guidebook I have ever seen. Almost a piece of art. Beautiful pictures, high quality construction -- truly awesome. Good job!" ... Tim Kemple, Pro Photographer.